Isles de Saint Domingue ou Hispaniola, et de la Martinique. 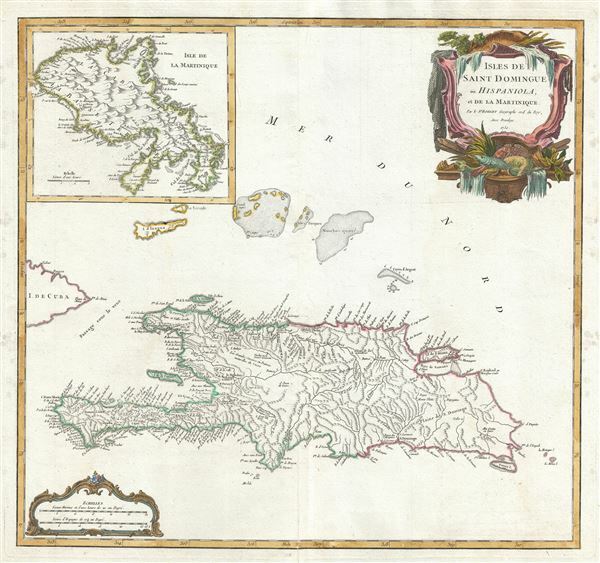 This is a fine 1750 map of Hispaniola or Santo Domingo (modern day Haiti and the Dominican Republic) by Robert de Vaugondy. It includes the southern tip of Cuba and the Inagua Islands (southern Bahamas). The map is highly detailed and identifies towns, rivers, political boundaries and other topographical features. This map also offers splendid detail throughout with respect to undersea shoals and reefs in the surrounding waters. A large inset in the top left quadrant features the Island of Martinique. Today Martinique, with its French Caribbean culture, lush rainforests, and stunning beaches is considered a jewel of the Caribbean. The top right quadrant of the map features a highly elaborate and decorative title cartouche. This map was drawn by Robert de Vaugondy in 1750 and published in the 1757 issue of his Atlas Universal. Very good. Minor wear and verso repair along original centerfold. Original platemark visible. Some spotting and offsetting with water stains covering a large portion of the map. Rumsey 3353.104. Pedley, Mary Sponberg Belle et Utile: The Work of the Robert de Vaugondy Family of Mapmakers, 480.